This post started, as so many of them do, with a seemingly unbelieveable photograph with no attribution information. It didn’t take long to find a Reddit thread discussing the photograph and tracing it to a television show called Destroyed in Seconds, a Discovery Channel series featuring ‘video segments of various things being destroyed quickly”. Episode 107 which initially aired in October 2008 showed the video of the Controlled Impact Demonstration performed at NASA-Ames/Dryden Fight Research Center in 1984. This episode can be viewed online but more interesting, I think, is a four-minute compilation by PDVideo3 of the testing videos released by NASA. This originally was a 10 part film clip series produced by NASA’s Langley Research Center, i have edited the various parts together as well as two other clips from NASA’s Armstrong Flight Research Center of the same test viewed from different angles. The aircraft was a Boeing 720, which had been purchased by the FAA in 1960 as a training aircraft. It was declared obsolete after 20,000 hours and 54,000 cycles and turned over to the Research Center for the Controlled Impact Demonstration (CID) project, a joint project between NASA and the American FAA . The plan was to crash the remotely piloted aircraft into steel structures constructed on the bed of Rogers Dry Lake at Edwards Air Force Base. The primary goal was to test anti-misting FM-9 additive, which could be blended with standard Jet-A fuel to inhibit ignition and flame propagation. The FAA was arguing for the anti-misting additive to be used in airliner fuel in order to increase the chances of survivability in the event of a crash. NASA also wished to experiment and gather data on structural loads in the passenger cabin, testing new seat designs, cabin fireproof materials and burning-resistant windows. Finally, the results of the test would give more information on the results of impact on flight data recorders. The CID project, affectionally nicknamed Crash in the Desert, required four years of preparation. Fourteen flights were undertaken with safety pilots on board to test the engines after the introduction of the modified fuel. They also tested the remote control system, with a pilot on the ground using a console to take-off and land under various configurations. Finally, on the morning of the 1st of December, 1984, the Boeing 720, with crash dummies as the only occupants, was ready. That morning the B720 departed Edwards for its 15th and final flight of the program. On the morning of Dec. 1, 1984, the remotely controlled Boeing 720 transport took off from Edwards on the 15th and final flight in the program. The fuel tanks were filled with 76,000 pounds of the modified Jet-A fuel and all engines ran normally from start-up to impact during the nine-minute flight. Flown by NASA research pilot Fitzhugh Fulton from the NASA Dryden Remotely Controlled Vehicle Facility, the airliner made a left-hand departure and climbed to an altitude of 2,300 feet. 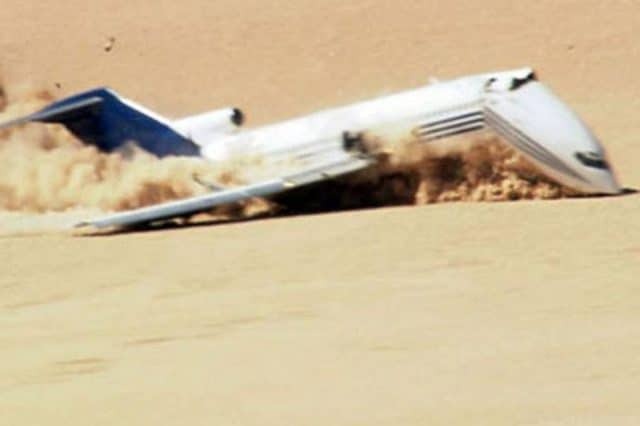 The flight plan called for the aircraft to touch down with its landing gear retracted on a specially prepared gravel runway on the east side of the dry lakebed. 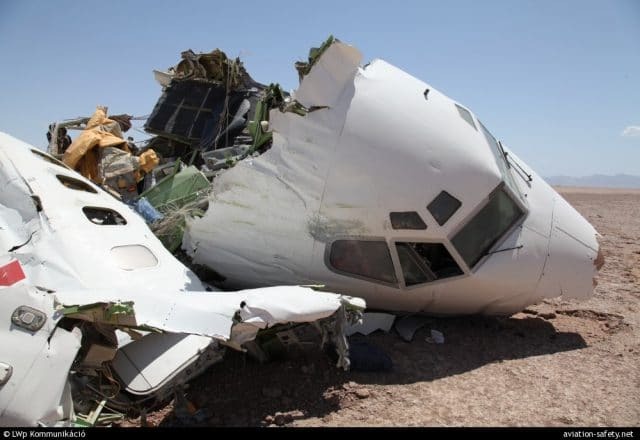 The intent was to have the 720 crash-land with its wings level exactly on the runway centerline, thus allowing the fuselage to remain intact as the wings were sliced open by eight steel posts cemented into the lakebed. The Boeing 720 began its descent with its landing gear retracted, with final approach along a roughly 3.8-degree glide slope. As the jetliner descended through the decision height of 150 feet above ground level, the aircraft was slightly to the right of the desired path, but appeared to have enough altitude for the remote pilot to maneuver it back to the centerline of the runway. Data acquisition systems had been activated and the aircraft was committed to impact. As the aircraft neared the lakebed, its left wing dropped and contacted the ground first, short of the wing cutters. This caused the nose of the airliner to swing to the left as it skidded on the lakebed surface at about a 45-degree angle. As a result, one cutter struck the inboard engine on the right wing, destroying the engine and causing a massive fuel leak that immediately erupted in flame. The airliner continued to yaw to the left until it was nearly sideways, causing the damaged right wing to break off and fold over as the fuselage was engulfed in a massive fuel-fed fireball. The fire took more than an hour to fully extinguish. After four years, the planned crash had failed in seconds. However, the stated goal of the program, which was to gather data about fire hazards and control in survivable crashes, was still achieved, especially when it came to the question of enforcing mixing FM-9 to jet fuel. The Controlled Impact Demonstration cast doubt on the enforcement of anti-misting additive in commercial airliners: although it was argued that the modified fuel prevented a hotter, more catastrophic fire during the test, the antimisting additive was clearly not able to prevent a catastrophic post-crash fire. The time from the slide-out to complete smoke obscuration in the forward cabin was five seconds, for the aft cabin, it was 20 seconds. Passengers would need at least 20 seconds to escape, estimated the officials. The cost of the CID was estimated at between $5 and $7 million US dollars over the course of the four-year project. Much useful safety-related data was collected, especially the fact that FDRs, new seat designs and fireproof materials were tested under real world conditions. The data collected was used by the FAA to establish new rules regarding fire-retardant seats and for floor proximity lighting to be mechanically fastened, as two types of adhesive-fastened emergency lights were detached during the crash, even without frantic passengers kicking them. In 2012, another Boeing was intentionally crashed, this time a Boeing 727-200, again fitted with cameras, crash-test dummies and various systems of recording. This test was organised by the Discovery Channel and took place in Mexico, as US authorities would not approve the test. The Mexican government authorised the federal permits required to stage the crash but specified that the aircraft had to be flown by a human while flying over populated areas. The aircraft took off from Mexicali’s international airport with the flight crew and ‘a small group of passengers’ on board. They parachuted out using the 727’s ventral airstair, with the captain evacuating from an altitude of 4,000 feet just four minutes before impact. The jetliner was controlled by remote-control from the chase plane for the remainder of the flight. The plane was going 140 mph at impact, which is close to regular landing speed. But the 727 was descending at 1,500 feet per minute, much faster than the 10 to 20 feet per minute of a typical airliner landing. [The remote control pilot] watched from a chase plane above as the cockpit tore away from the body of the plane and collided with its left wing on impact. The flight engineer would have died, he says, but the pilot and co-pilot might have survived. 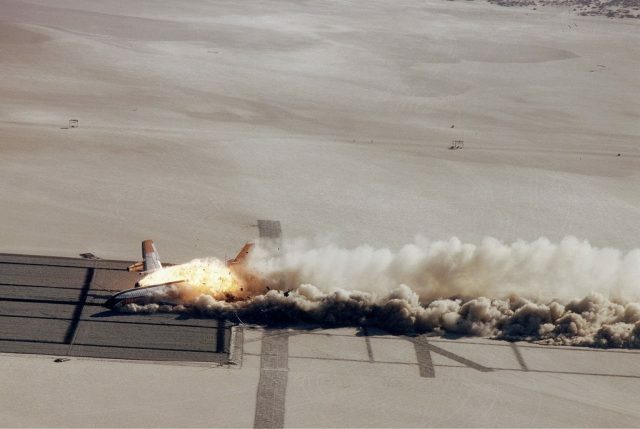 Although the program concluded that the test proved that passengers at the front of the aircraft would be most at risk in a crash, the experiment was dismissed by many as a publicity stunt and in poor taste. Specifically, on British Channel 4, viewers were encouraged to log in to the website to choose their seat and they would find out after the show how their booking fared. 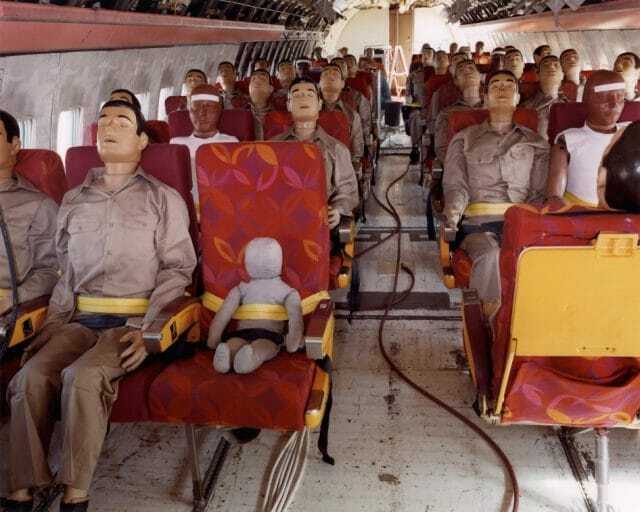 The show concluded that dummies using the brace position had a higher rate of survival and that the ‘cheap seats’ in the back were the safest place to be. Since then, Time magazine has done a study of crashes in the US and determined that sitting in the middle of the aircraft was the safest position. Finally, in 2017 the FAA were asked directly for their opinion, stating unequivocably that every crash is unique and there is no such thing as a ‘safest’ seat. Looking at the two test crashes, I think it’s safe to say that in both instances, the seat with the remote control was the safest. “The seat with the remote control was the safest”. I like that one. But unfortunately, we have not progressed to virtual flying yet, we still have to strap in and hope for the best. I cannot see totally autonomous aircraft taking over, either. Not any time soon, probably not before the end of my time ! But these tests in my considered opinion did provide a lot of useful data. And if they save only one life, it will be money well spent. A long time ago, it may have been in the ‘seventies, there was a study about the feasibility of a collision avoidance system. We know that this resulted in the development and implementation of TCAS. However, in the initial phase there were more proposals. One of them was a project that proposed enabling ATC to take over direct control by signals to the autopilot, overriding selections made by the crew. This was to be effected through a new development of, or addition to the ATC transponder. This never got any further than a “think tank” phase, whereby electronics engineers, ATC controllers and representatives of the airline pilots’ unions would come together and discuss the merits of various proposals, most of which never came to fruition. Existing technology at the time would have been sufficiently advanced to make it possible. The thought was to first have ATC controllers take over, later to be further developed into a totally autonomous and automated system. The rationale was that it could save lives. There had been mid-air collisions caused by ATC confusion, languages used by ATC other than English was one of them. The main argument was that in case of imminent danger, ATC had to call the flight, wait for a response, issue an instruction and hope that the crew would react in time. This delay might just be the difference between a near miss and an accident. If in extreme cases the track or altitude of the aircraft could be changed by direct intervention from ATC, this delay would be eliminated. There were many factors that stopped this idea right in its tracks. The main objection was that pilots were absolutely, vehemently against the idea that at any given time a controller, or worse: an ATC computer, could take over control of the aircraft. There were legal issues, not the least the matter of taking part of the authority away from the captain. The system would not be world-wide for a long time. Not every ATC centre would have the right equipment, right equipment, or get the budget to upgrade. Not to mention the legal swamp, should this system ever contribute to an accident rather than prevent it. The counter-argument that the crew could regain control instantly just by disconnecting the autopilot did not convince the representatives of the pilots unions. There were many difficulties and this idea never even made it to the drawing board. It was an idea that was rejected in the early phases. That is why nobody even heard about this project. I heard it from a pilot who was on some committee. Later it was confirmed by a senior Air Traffic Controller who had not been on such committee himself, but was involved later with the implementation of TCAS and held lectures where pilots were informed about TCAS and how to use it. It’s also a security nightmare, though it involves issues that weren’t as widely recognized back in the 70s. Consider that the equipment and software to do this override would be present in ATC centers around the world, making it impossible to keep “secure”. It would be a matter of time before some terrorist gained the ability to take over airplanes at a distance. “Widely recognized”, no. OTOH, _The Adolescence of P1_ (1977) includes a ~rogue AI crashing planes in response to threats to its existence; the author may have been utterly ignorant of how ATC actually worked at the time, or may have heard about this program and thought what could happen if it were in place. Hacking then was more dreamed (nightmared?) of than real; these days, such a hack could already have happened. I remember that novel! IIRC, it was one of the better AI tales I’ve read, with real attention to the moral issues involved in creating an sentient being. It’s worth noting that a true Turing AI wouldn’t need “super computer powers” to make trouble — more-or-less by definition, they could use social engineering like many human malefactors do. Of course, they likely would have advantages in dealing with ordinary computer systems, but even there, they’d be exploiting the same security holes and penetration techniques that human hackers would.